Super Bowl XLIII is arriving in a full-on recession, so exploit the tone and go retro with your party menu. C'mon, it's football. Your guests are not expecting molasses-braised duck legs with frizzled leeks, toasted garlic potato rounds, and winter fruit crostadas (an actual suggested menu I spotted). Just tasty, warm food. Aldi, my new favorite store can help you with that. For chicken wings and meatballs to sausages, pizza, chips and mixed nut snacks, it's a one-stop shop. You can even pick up an "elegant" German pilsner, Holland lager and South American cerveza—beers exclusive to the international grocer that is Aldi. 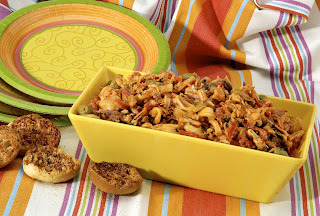 Consider serving mom's meatloaf or a tuna noodle casserole topped with crushed potato chips. Recall family dinners when you were ten years old, and you'll come up with fun, kitschy menu options. Red (Cardinals fans) or yellow (Steelers fans) JELL-O salad with marshmallows, pecans or orange slices will recall an era long past. Make funky mold shapes and use whipped topping. Flaunt your menu and it may be a long-talked about hit. Tomorrow's post will give the skinny on shopping Aldi—Broke Girl's new favorite grocer. Find Aldi locations here.